B.N.M. 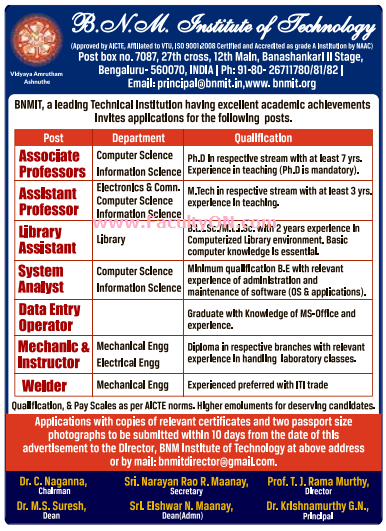 Institute of Technology Bangalore has advertised in THE TIMES OF INDIA newspaper for the recruitment of Teaching Faculty- Professor / Associate Professor / Assistant Professor jobs vacancies. Interested and eligible job aspirants are requested to apply within 10 days from 18th July 2018. Check out further more details below. Qualifications: Convent School Educated with M.A in English having 1st class and having more than 5 years of teaching experience. How to Apply: Interested and eligible candidates are requested to send hand written application along with copies of certificates and 02 recent passport size photo the postal address given below. Reference: Advertisement from B.N.M. Institute of Technology Bangalore on THE TIMES OF INDIA newspaper dated 18th July 2018 for the recruitment of vacancy position such as Professor / Associate Professor / Assistant Professor faculty jobs. See the copy of advt below.